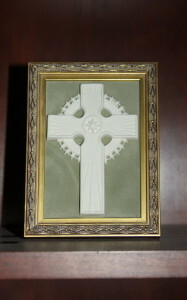 Scattered around our home, there are many small and unusual framed items. 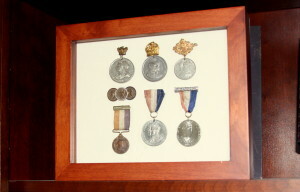 Some of these items are a collection of collectible items or cameos or historic royal medals. These add personality and interest to our home decorations and are displayed throughout the house. 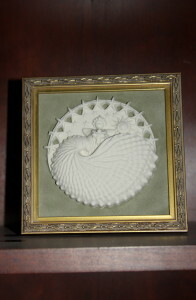 In my home office, I have recently added two wonderful collectible pieces by Margaret Furlong. She is an artist located in Oregon that designs beautiful decorative pieces inspired by nature made in bisque porcelain. The two pieces from her collection currently on the bookshelves in my home office are the “Heaven and Earth” and the “Hope for a New Millennium” which were purchased several years ago and originally were displayed in my daughter’s nursery in our California home. 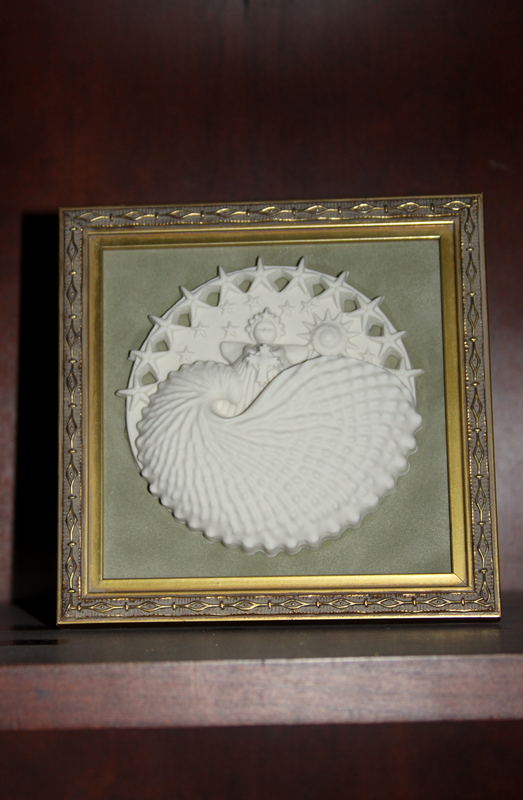 To create these two framed collectible pieces, I purchased inexpensive gold frames that perfectly fit the Margaret Furlong pieces and two lovely pale green “velvet” scrapbook papers from the local craft store. I removed the glass and backing from the frames then cut the “velvet” paper to fit the frame using the glass as a template. I attached the collectible onto the paper with hot glue; carefully making sure that it would be perfectly centered within the frame, and then hot glued the paper with the collectible attached to the frame’s glass for additional support. Finally, I placed everything back into the gold frame and it was ready to hang on the wall. This easy craft project took 30 minutes to frame both pieces. These two framed collectibles are a wonderful example of how to display small items in a beautiful way. Displayed in my home office is a shadow box that displays commemorative medals of the British Kings and Queens. As mentioned in this month’s Celebration post, Victoria’s Day, I am fascinated by the British Royal family. My interest was sparked several years ago when I read a novel about Queen Victoria. Since that time I have read numerous books about the royal family and while visiting England several years ago I had an opportunity to see the castles and country homes of the royal family which I had been reading about in their biographies. 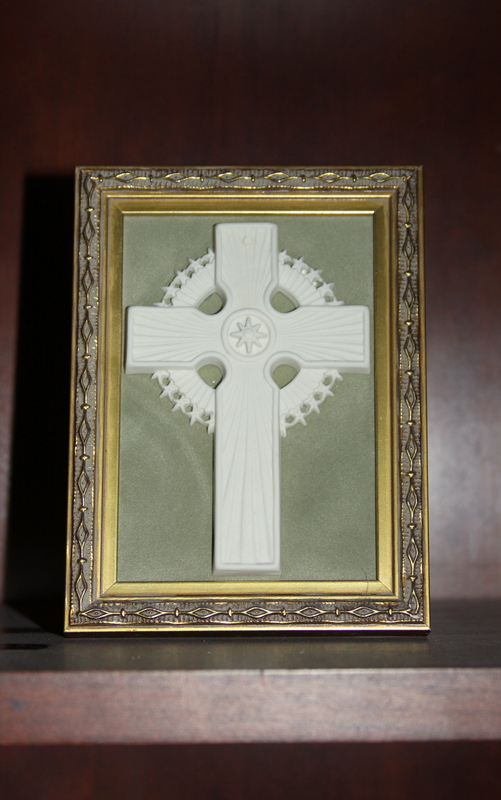 This inspired a collection of commemorative medals of the British Kings and Queen. The first one dates back to Queen Victoria and commemorates the Diamond Jubilee and her 60 year reign as Queen of England. Additional commemorate medals include the coronations of the Kings and Queen that followed, King Edward VII, King George V, King Edward VIII, King George VI and finally the current Queen Elizabeth II. One very unique pin marks the year 1937 when England had three kings. During that one year England had three different kings, they were King George V who had recently died at the beginning of 1937, King Edward VII who abdicated before his coronation and then King George VI who was crowned at the end of 1937 and he is the father of the current Queen Elizabeth. This particular pin is my favorite one in the collection. All of these seven commemorative pins are in a walnut shadowbox and are wonderful way to display the collection in my home office. Several years ago while shopping on ebay, I came across a great source for cameos. I purchased several not knowing exactly what I was going to use them for, originally I was thinking of using them for a jewelry project. 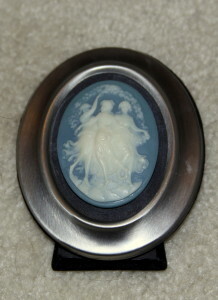 Instead, I decided to frame a lovely blue cameo the same way I framed the Margaret Furlong pieces. I purchased a small silver frame from the local craft store, dark grey “velvet” scrapbook paper and used the same process, it worked out beautifully. The framed cameo now sits on the side table in our master bedroom and is a lovely decorative accent. Down in our basement there is a bookshelf which is filled with family memorabilia (in the future I should write a post regarding the bookshelf and how everything is displayed!) Anyway, there is a very special piece that commemorates our daughter’s baptism and the story behind this piece is very interesting. First, I need to explain that both my mother’s parents emigrated from Poland through Ellis Island in the early 1900s. Needless to say when Pope John Paul II became pope in 1978 my mother was very excited. Several years ago when I was working on a special 80th birthday book for my mother, I wrote to the Pope hoping that he would respond and to my surprise he did write back with a lovely letter wishing her a happy birthday. 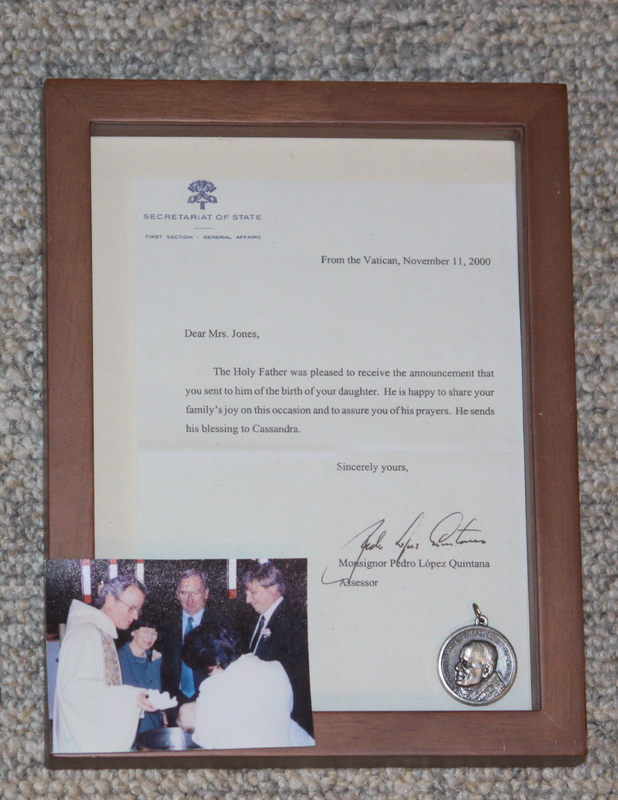 To conclude the story, when it came time for my daughter’s baptism, I again wrote to Pope John Paul II and received a letter blessing her on this special occasion and enclosed with the letter was a very special medal for her. I copied the letter, reduced the size to fit the frame I had purchased, the original letter went into her baby book, and in the small shadowbox I included the medal the Pope sent along with a photo taken at her baptism. This is an example of a very small item, the medal, being displayed in a wonderful way to commemorate a special and blessed event. In the entertainment center down in the basement are several walnut cases specially made with a black liner and they are perfect for holding a collection of pins gathered during our road trips and overseas travels. 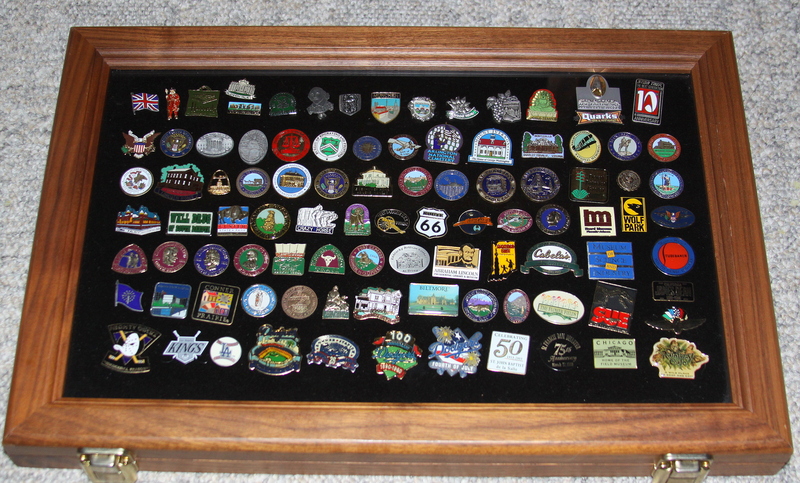 Almost every place visited on our travels I will purchase a pin as a souvenir and over the years I have collected hundreds. 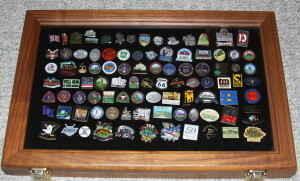 Most of these pins are displayed in these special large walnut cases. Check out this month’s Décor post, Travel Souvenirs, for more information regarding the other items we collect during our vacations and how they are displayed in our home. 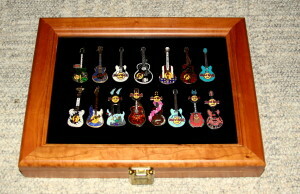 Two small walnut cases are also displayed in the entertainment center. 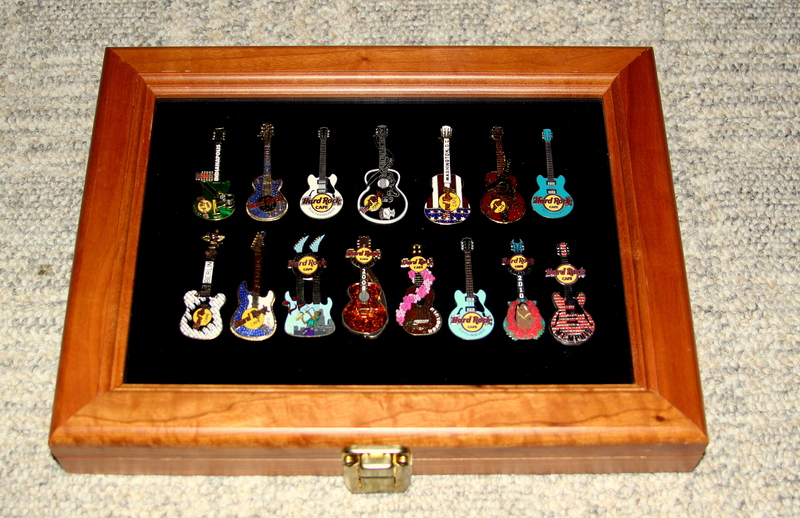 One case holds a collection of Hard Rock Café guitar pins that were purchased while dining at the restaurants in several U.S. cities and other locations in Europe and Asia. We like the food at the Hard Rock Café and if we are visiting a particular city on our travels I always check to see if there is one located there. 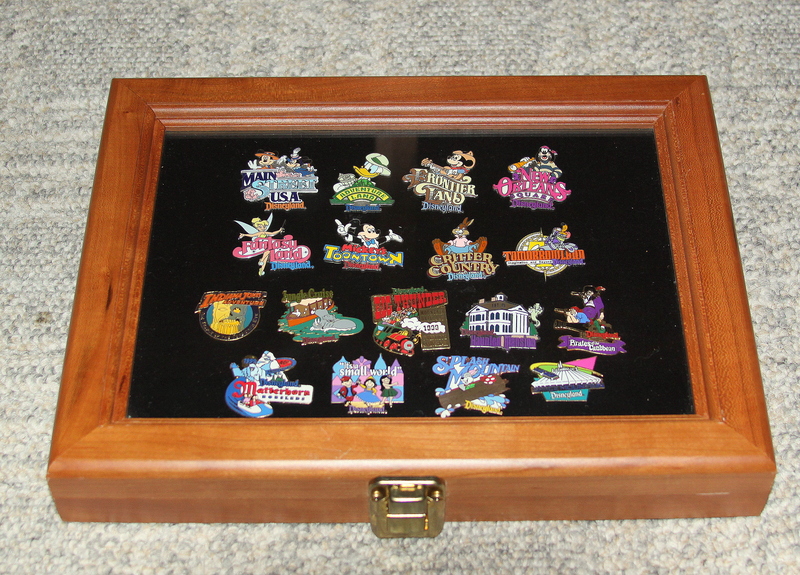 As mentioned in a previous post, Disney Memorabilia Collection, part of our Disneyland souvenirs is a collection of over two hundred Disney collectible pins. Most of these pins were purchased during our visits to Disneyland or online from e-bay when I am looking for rare or discontinued pins. 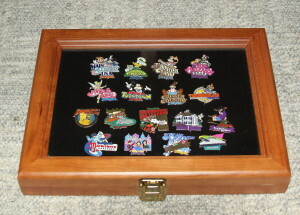 A small part of the pin collection is displayed in one of the small walnut cases and the rest of the pins are stored away. 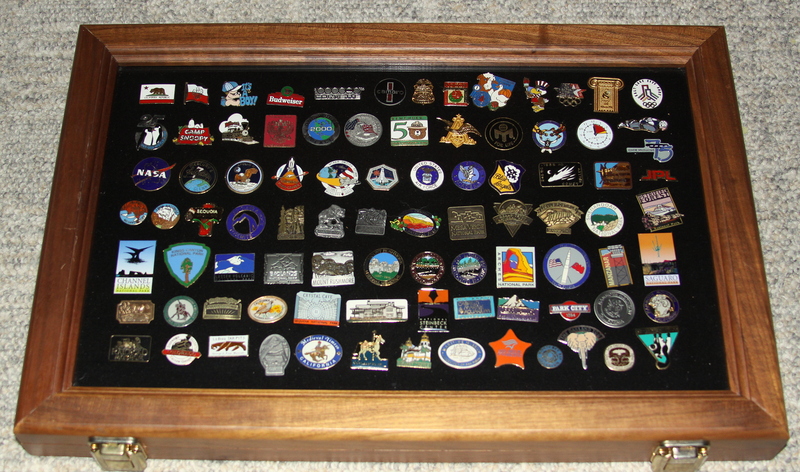 These walnut cases are an example of a terrific way to display a collection of small items and sometimes when we are down in the basement watching movies I will pull out one of the walnut cases and look at the pins and remember the places we have visited. So, when you are purchasing small decorative items, think about displaying them in small frames that would look wonderful on bookshelves or tables in your home. 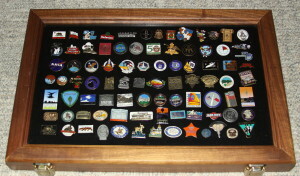 If you are a collector of small items like pins and medals, think about displaying the items together in shadowbox frames or special cases that are made specifically for this purpose. My basic idea is that if you have purchased and collected these items take some time to display them in a decorative way to enjoy every day. This idea is also a wonderful way to add interest and personality to a home. This entry was posted in Decor and tagged 1937 commemorative medal with the three kings of England, A display of commemorative medals of the British Kings and Queens, Barbara Jones, cameo frame, Collection of commemorative medals of the British Kings and Queens, Decor, Disney collectible pins, Displaying Margaret Furlong decorative items, Enchanted Manor, Framing a cameo, Framing Margaret Furlong collectible items, Framing Unusual Small Items, Hard Rock Cafe pins, How to display Disney collectible pins, how to display Hard Rock Cafe pins, How to display travel pins, King Edward VII coronation medal, King Edward VIII coronation medal, King George V coronation medal, King George VI coronation medal, Margaret Furlong, Pope John Paul II medal, Queen Elizabeth II coronation medal, Queen Victoria diamond jubilee medal, The Enchanted Manor, Travel collectible pins by barbara. Bookmark the permalink.